One way to get there is to consider how, from the buyer's perspective, the line between marketing and sales today has functionally blurred: Marketers have to think like salespeople, and salespeople have to act like marketers. Content is what brings the two together. (That’s why we have a saying at Uberflip: #ContentIsForClosers: "It’s not just for marketing anymore.") Here are five tips for "bringing the two together," using content. 1. Understand the friction between marketing and sales. The dance between marketing and sales teams is as old as time. Marketing complains that sales doesn’t use the content and collateral provided. Sales complains that its members aren't getting enough quality sales-ready leads. The reality is that the blame rests with both sides. The problem with content marketers is they may create great content for awareness and for capturing leads, but the supply of useful content dries up beyond the lead capture. Where’s all the content that extends to the next step, to support sales? On the flip side, the problem with sales is that its members don’t always recognize where content fits in the process and how it can help them do their jobs. They haven’t defined the sales process enough, so they’re not communicating what they need from the marketing team. Content can close this gap, but only if it’s aligned for both marketing and sales. We need to think of their respective roles from the buyer's perspective -- as one fluid process. 2. Design a framework that uses content to drive sales. Using content for sales enablement starts with creating the right content, to begin with. Marketing tends to operate behind the scenes, spending little time actively engaging with customers. Sales, on the other hand, is on the front line, listening (Note: not just pitching, but really listening) to customers every day. Salespeople, then, are a gold mine for content ideas that your customers actually care about. They’re the ones who spend the most time with the customers you’re trying to reach. When sales and marketing are on the same page, marketing can start creating content that specifically addresses the steps in your customers' buying process that arise when they’ve actually engaged with your representative. What is the biggest nonproduct-related question you hear? What are the main pain points you’re hearing from customers? What objections are you hearing from prospects? The reality is that your customer, your product and your company aren't static entities. They evolve over time. So, make sure you circle back to these questions over time -- don’t just ask once and assume you’ve solved the world’s problems. 3. Organize your content for both your sales team and buyers. It’s not enough to create the right content. Content that is effectively leveraged for sales enablement needs to be easy to find for both your buyers and your reps. Many people will seek out information about your product or service on their own, so it’s important to make sure your buyers can reach the content they need on your website. And, if they don’t see that content before engaging with a salesperson, that salesperson should be able to find it, to leverage during a conversation with the prospect. You can organize your content by format (blog posts, ebooks, webinars), and make it more accessible by using a structure that’s meaningful to your buyer's persona, meaning his or her needs and interests. One example we often see is the resource center or content library, which houses a large amount of great content. A problem may occur, however, when, because of the way the center or library is organized, it doesn't yield what is needed at some particular moment. Instead, I'm probably looking for content (whether it’s a webinar, an ebook or something else) about a specific topic that I think you and your company can help with. Here’s a great example of how to do it right. Booker, an end-to-end business management software for service-based businesses, and an Uberflip customer, has made incredible leaps and bounds with its content strategy, significantly increasing its content ROI. A big part of this came from creating a well-organized content experience so that buyers and the company's own team could find exactly what they needed. Check out the screenshot below. 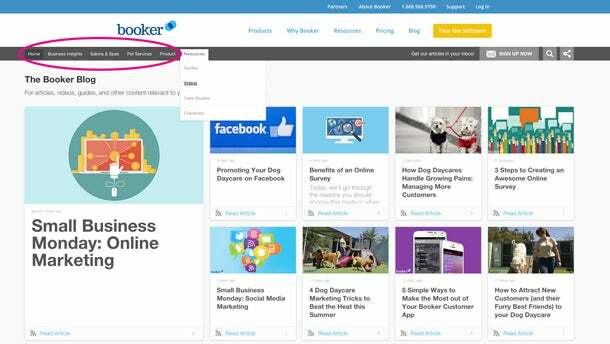 You’ll see that Booker organized its content by topics that make sense for its buyers' personas, and also by type -- the best of both worlds. Organized by topic and content type. 4. Sell your sales team on actually using your content. Salespeople have gotten a bad rep. Within a company, some people see them as either lazy or indifferent about content. They just want something to send to their prospects. But, in fact, salespeople are evolving. The reason is that the function of sales has changed, and more companies have started to focus on better alignment between marketing and sales, using an integrated approach that includes content. But, what if your team is resistant to change? How do you deal with “old school” sales reps, or reps committed to an outbound mindset, who have never leveraged content? An outbound approach focuses on finding good companies, based on revenue, team size and other variables, then seeking any pain points they may have that your solution can ease. There’s a lot of “feeling around” and, as a result, there may be failures in this approach to prospecting. An inbound approach is just the opposite. Thanks to a prospect’s established interest in specific content, the sales team has a better idea of what pain points the prospect may have and how your solution can help. At that point, the only question is: Is the company the right fit? These days, there are a variety of tools to help you discover a company’s profile (not to mention good old Google) and easily answer this question. 5. Have your marketing set sales up for success. By pre-screening leads based on the content that is consumed, marketing can help sales spend its time and effort more effectively. The key difference, from a sales standpoint, is that the sales rep is better informed about a prospect’s interests, even his or her pain points, before the calls and meetings begin. Conversations can even open with the prospect's specific interests and concerns (e.g., "Why did you download the ebook or watch the webinar? "), before shifting to how your solution can help. When you look at the process that way, marketing’s role in this relationship is actually to set sales up for success. And that way, everyone wins.